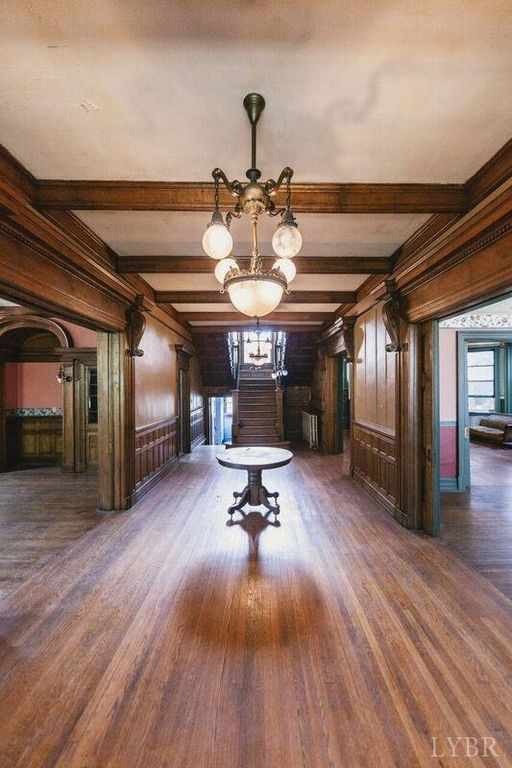 Seated atop Downtown Lynchburg's own Diamond Hill, this magnificent property is the most elaborate and unique home currently on the market. 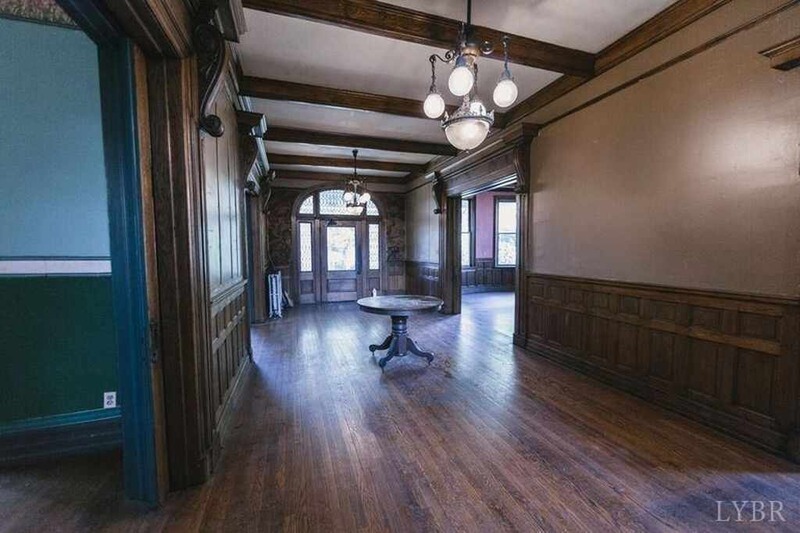 You will truly lose your breath when you walk into the front entry and witness the ornate original light fixtures with their many arms and glass domes, surrounded by beamed ceilings all that have managed to remain in original unpainted condition for more than 100 years, to the left you will witness even more elaborate wood work in the dining room with its coffered ceilings, built in china cabinet, wainscoting and over 5' tall mosaic hearth flanked by delicately carved lion heads. 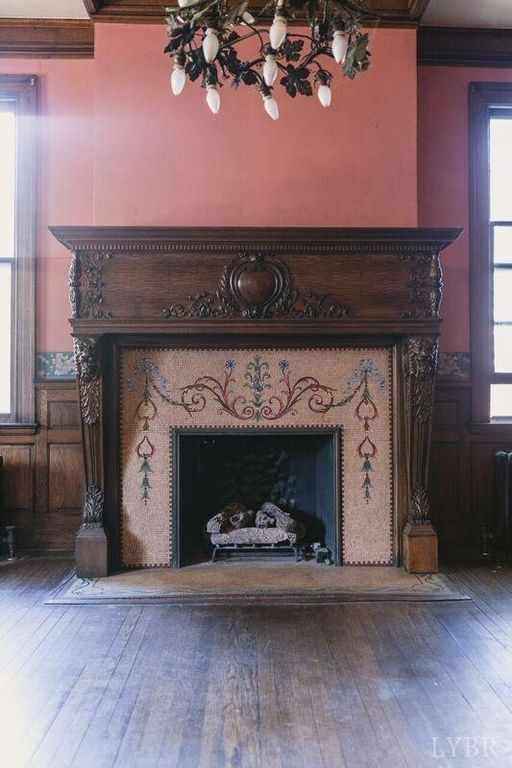 The parlor to the right features ceilings ornamented with floral garland plaster work while the mantle is of white marble. 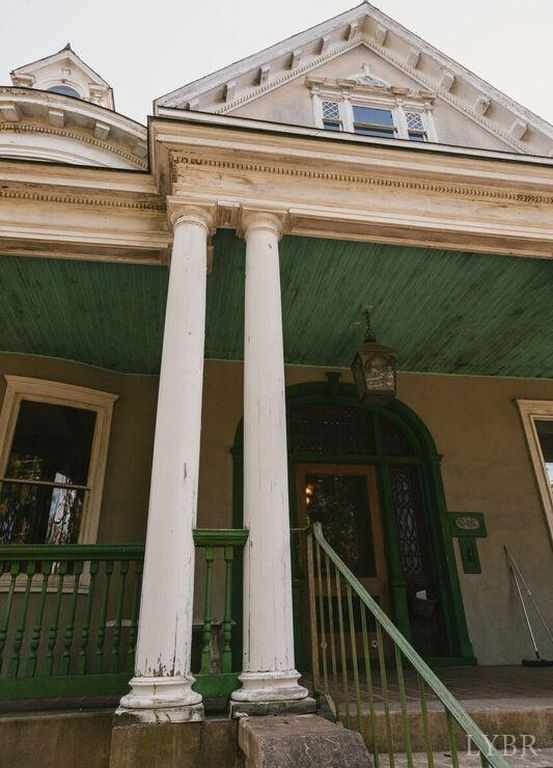 With 10+ BR's, french doors, sun rooms, secret garden lot that spans from street to street and much more, this is your once in a lifetime opportunity to own one of the most beautiful homes in the region, you truly will not believe it when you see it. Thanks John S. for sharing! Thank you Kelly for sharing this outstanding home which was shared with me by a friend of mine. 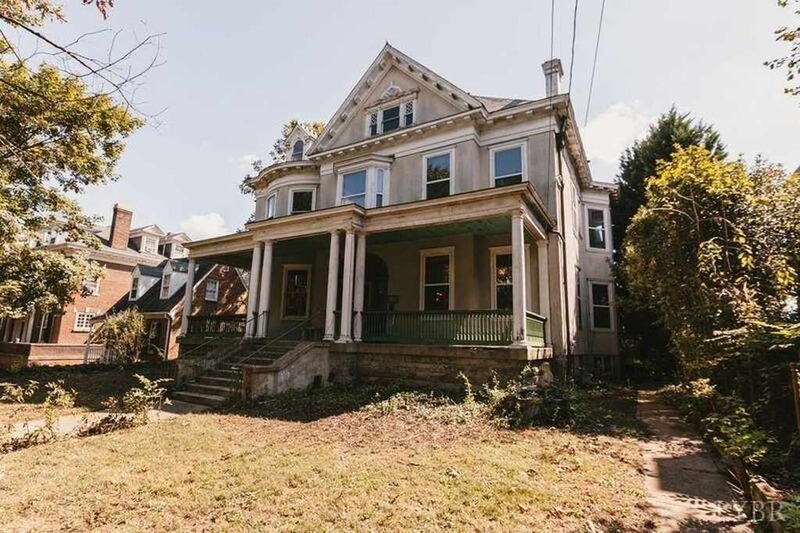 In some places after being fully restored I could see this turn of the last century selling for well into the millions but probably not in Lynchburg. 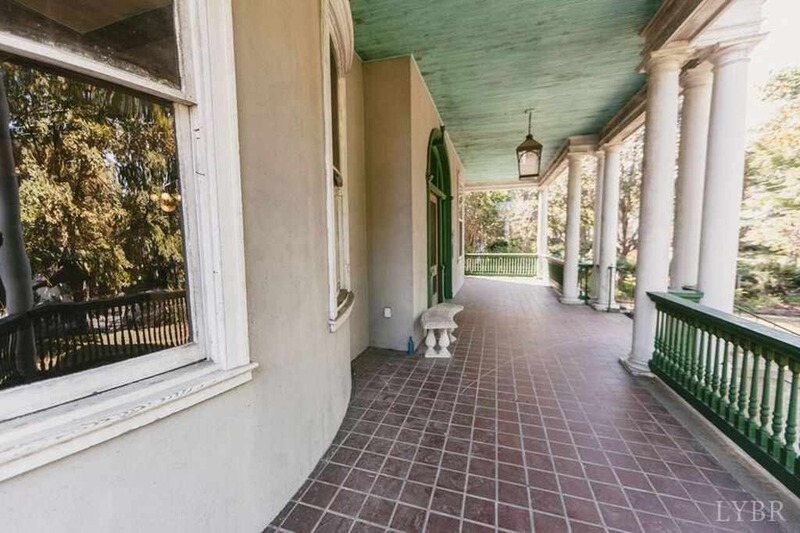 Of course, this price-location trade off allows folks like me who are not part of the one percenter class to dream about what it might be like living in such grand surroundings. 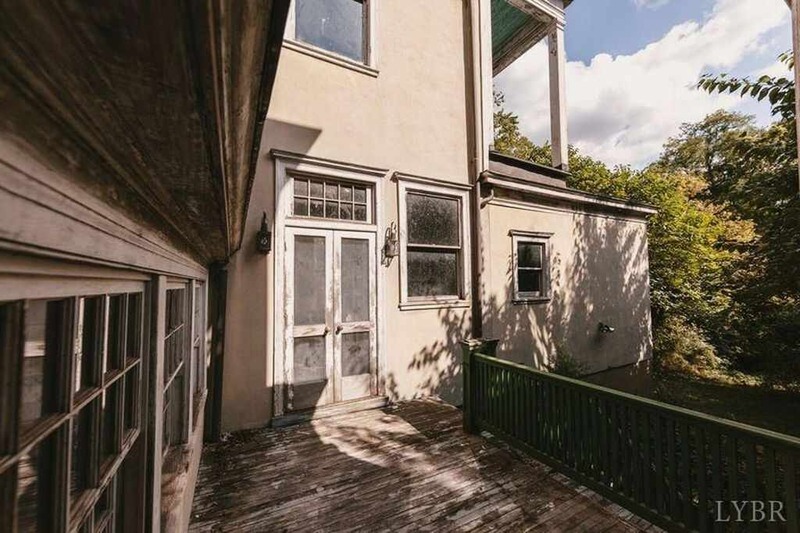 There’s also the old adage about “buying the worst house on the nicest block” and that seems applicable here. Streetview shows this as being a grand residential area a from a century ago that at least still retains some of that flavor. 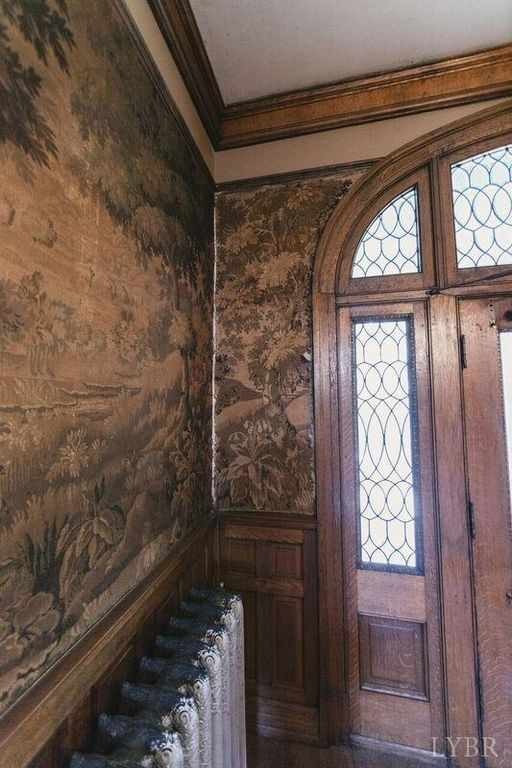 No doubt the owners of the other nearby grand homes would be delighted to see someone fully restore this faded grand survivor. I also looked for tax information and found none. Seems reasonable for a home of this quality. I noted on the county website it is assessed at $400,000. 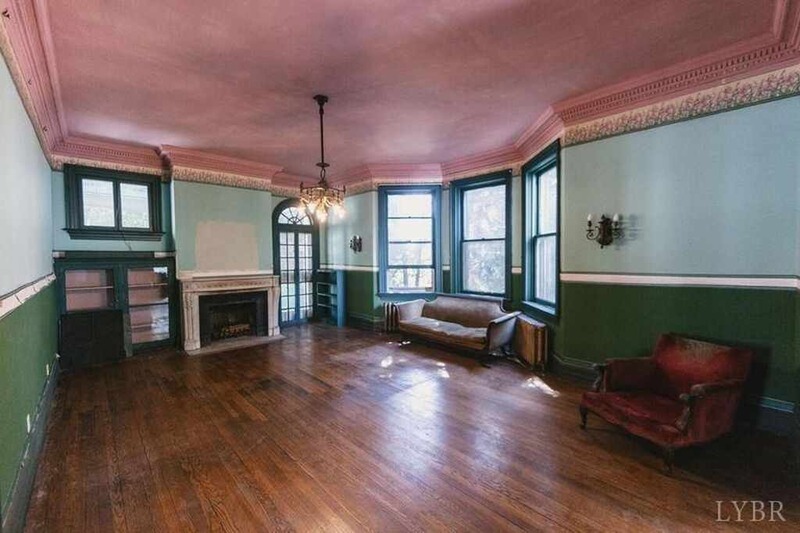 Not sure if it sells at $350K (or less) that the taxes could be adjusted any lower but for any prospective buyer with intentions of a faithful restoration, it might be worth checking if there are any local tax freezes (10-15 years are typical) for newly restored homes in historic districts. Thanks for the tax information. John Shiflet, I immediately thought of you when I saw this house! It does not surprise me one bit that you submitted it!! 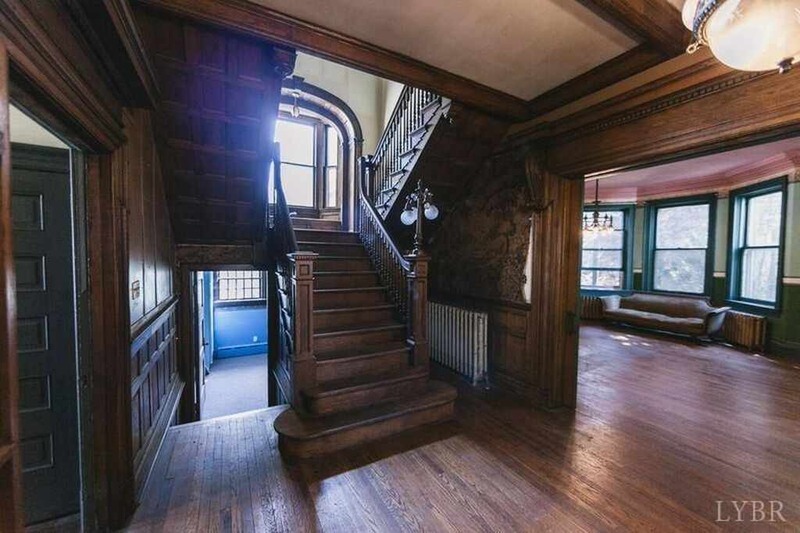 This house is a stunning beauty. I’d love to see a full restoration on her!! You need to check out the aerial view to get a full appreciation for the scale of the house and the others in the neighborhood. That is a lot of house for the money. It seems like it could be a very good long term investment with the right restoration. 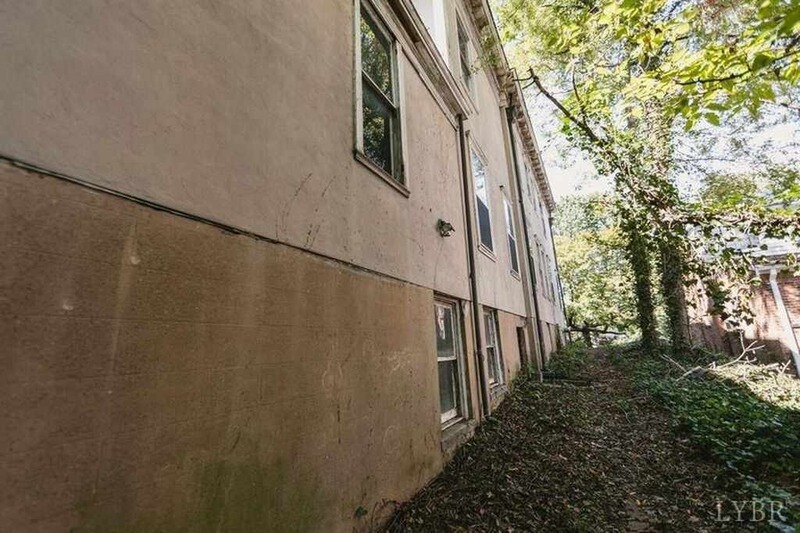 It would be truly amazing what a good pressure washing would do to the exterior of this home. 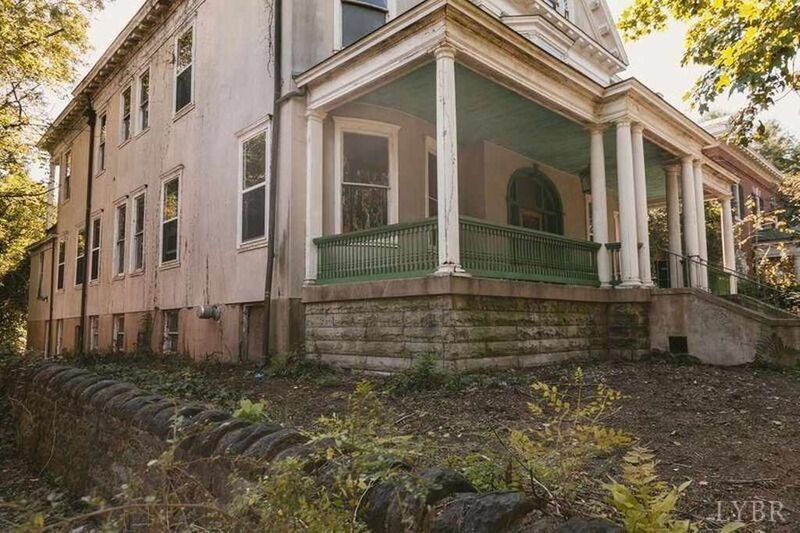 I am sure there is some water damage to some of the exterior, but I bet between pressure washing, a good paint job and some water seal, this thing would “pop” and be brought back to life in a big way. Most of the inside looks cosmetic as well. 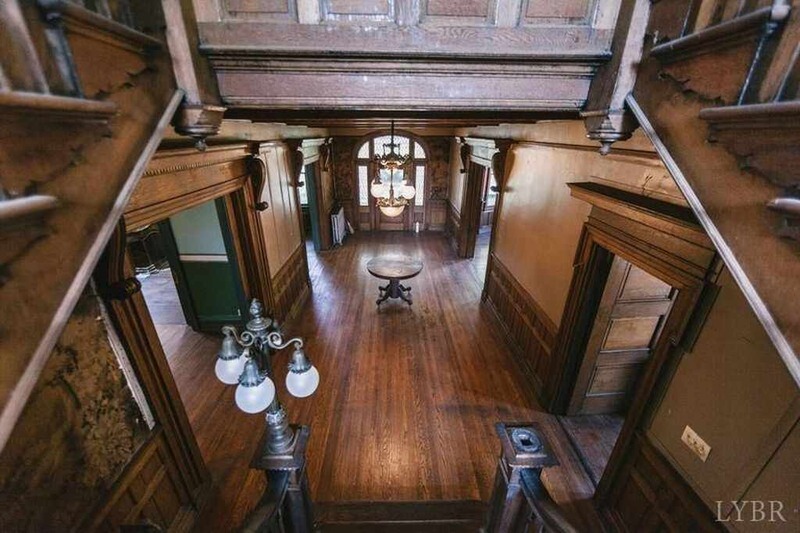 There are a few missing globes and newel posts. 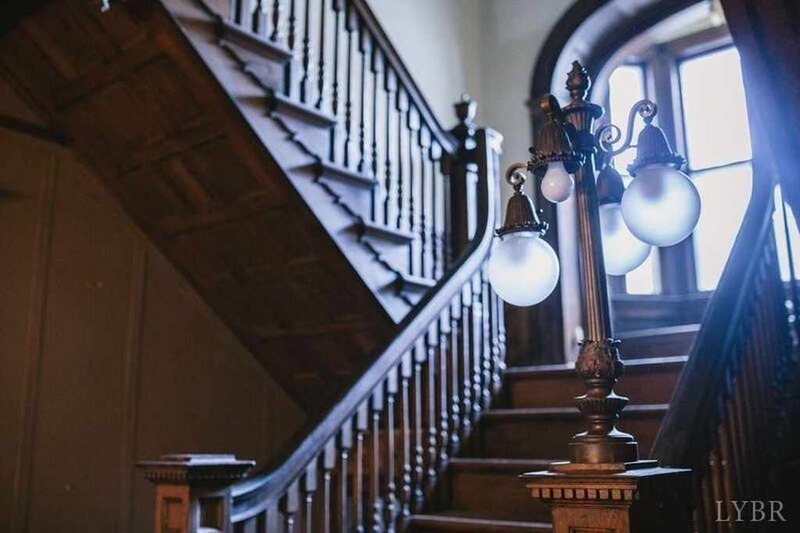 The lantern is missing from one staircase, so sadly, they both may have to be replaced. Still, it retains so much original charm. Good golly, what a magnificent house!!!! That would make a wonderful retirement project. 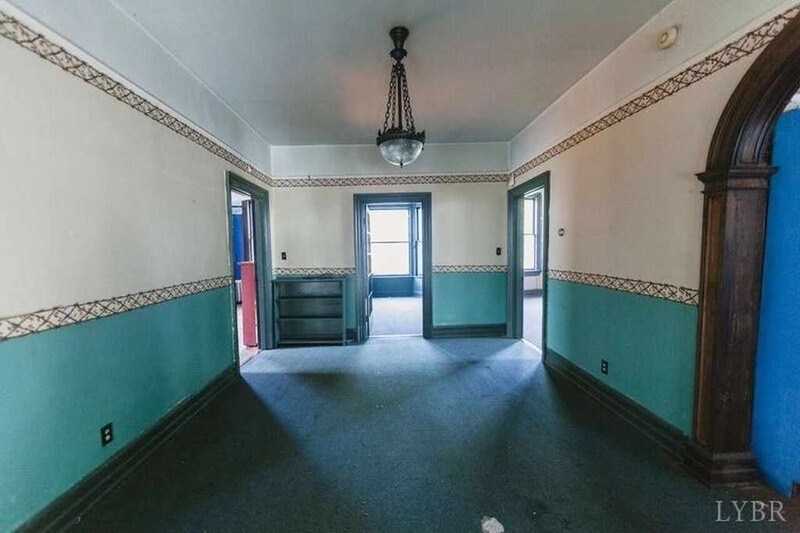 All that space, all that character, and it looks like so many of the details are still there. 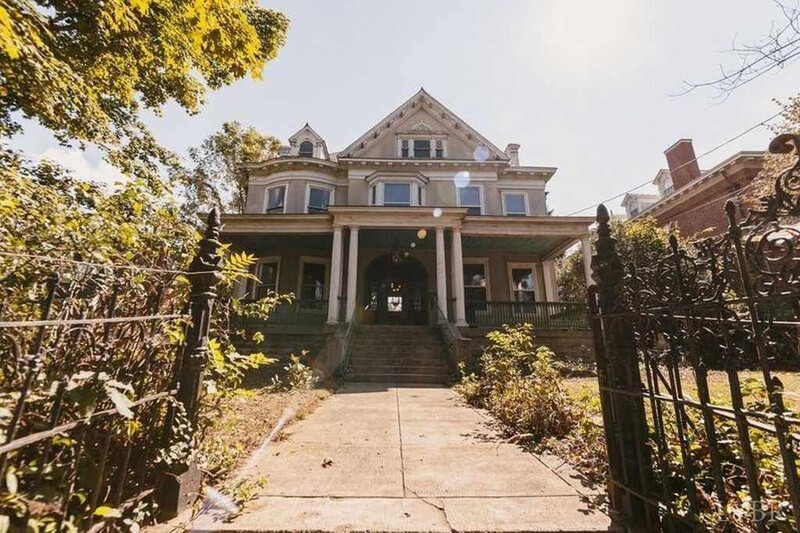 Looking at the state of the exterior (especially the woodwork) I suspect there is a lot of work (read: $$$) lurking under everything, but still… it would be a pleasure to live in a beautiful beast like this! I am completely in love. What an amazing home, I would not change a thing. And the neighborhood is fitting for such a grande dame. That’s worth something in and of itself. Why no pictures of the bathrooms? Sweet baby pinapples, this home is incredible! Wow, one of my faves for sure! LOL…(sweet baby pineapples) so funny Jennifer HT. 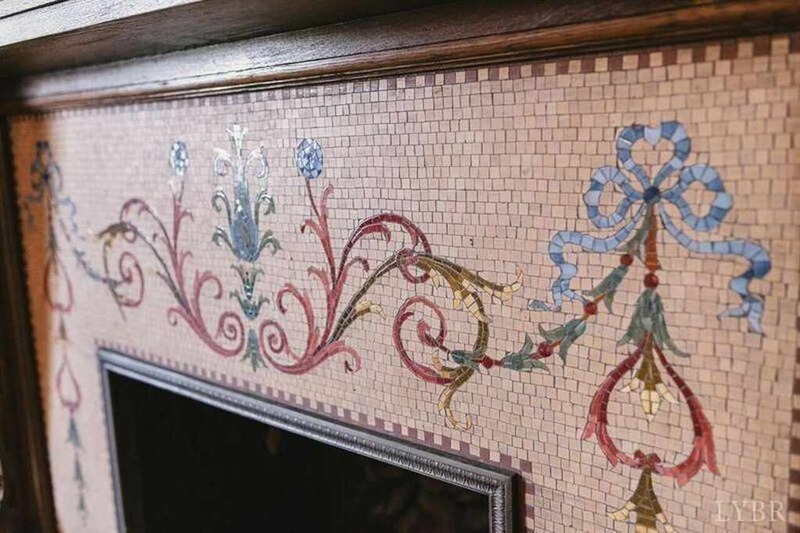 ONE of the things I like best about this house is that fantastic micro mosaic tile fireplace surround. Never seen anything like it. Oh my goodness! I do believe this just jumped very close to the top of my dream house list. This is a beauty! 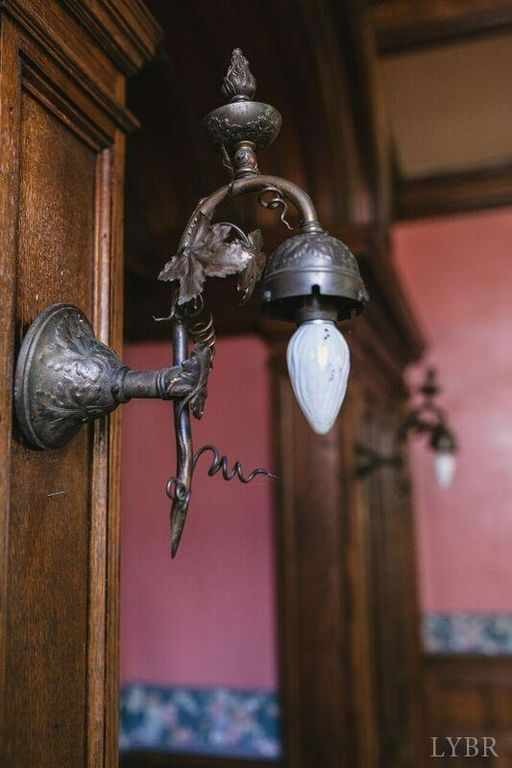 Those light fixtures are awesome! So much to love. 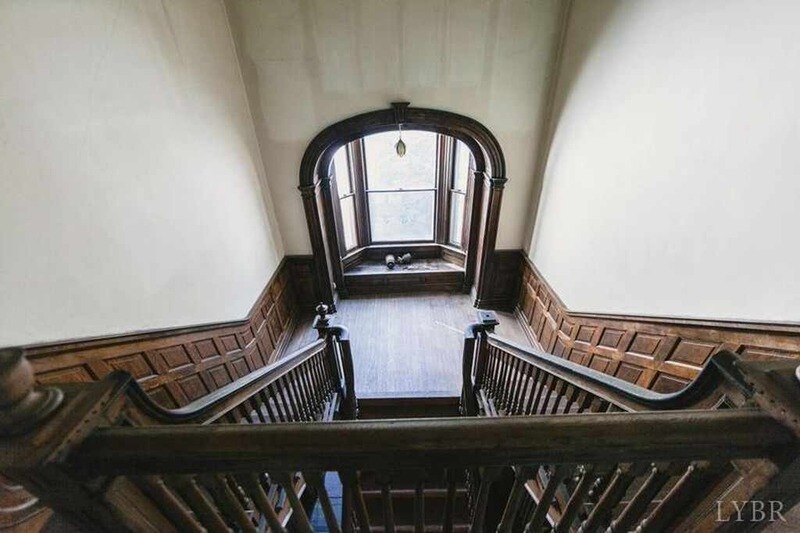 And the main staircase! I can just see it all polished up. WOW Wish there were bathroom pics to drool over. It’s in a prime neighborhood in a historic beautiful city on the James River. Walk to restaurants and the waterfront from your front door. Low cost of living, low crime, clean air and water, several local colleges and businesses are here as well as hospitals, four moderate seasons make for an ideal climate and plenty of outdoor adventure and scenic beauty are just a few of its attributes. Lynchburg Virginia is one of the best kept secrets, I’m so lucky I stumbled upon it 20 years ago. I love it more every day. I went to school in Lynchburg — Randolph-Macon Woman’s College, which no longer exists. We rarely strayed from campus unless it was to visit a neighboring school like Washington & Lee or UVA — so for me, Lynchburg was not the usual college town but a settled place with lots of lovely, older homes. And you’re so right, Dede — that’s such a beautiful part of a beautiful state. Wow, that house is amazing. 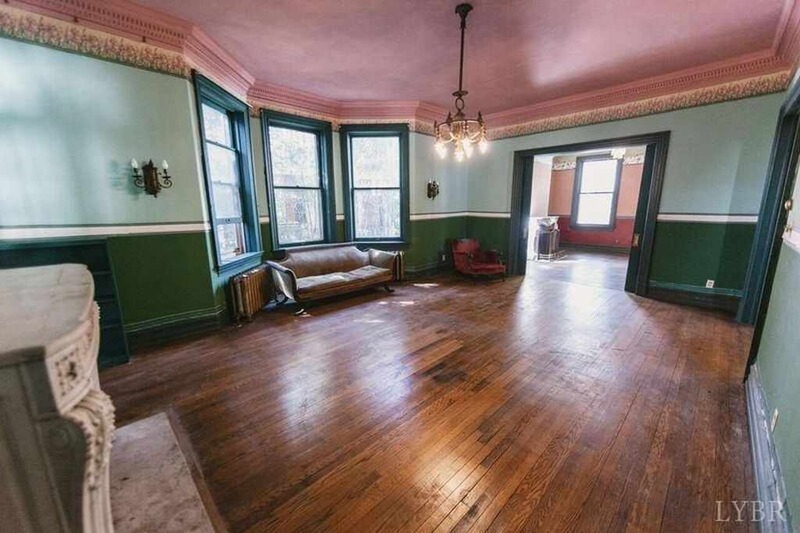 This house is…wow. just wow. The only word that comes to me is exquisite! One of my all time faves! 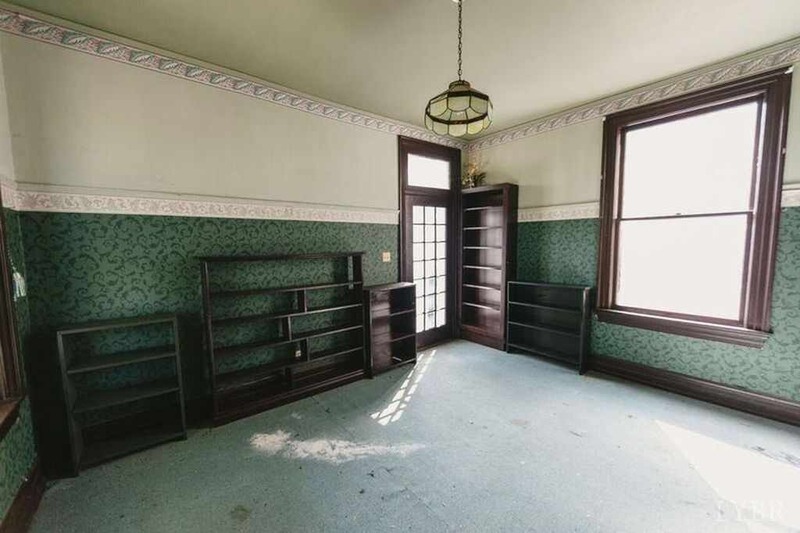 The only thing I don’t understand is all the random bookshelves all over the place. But wonderful otherwise. I love that Sun room! The lights! 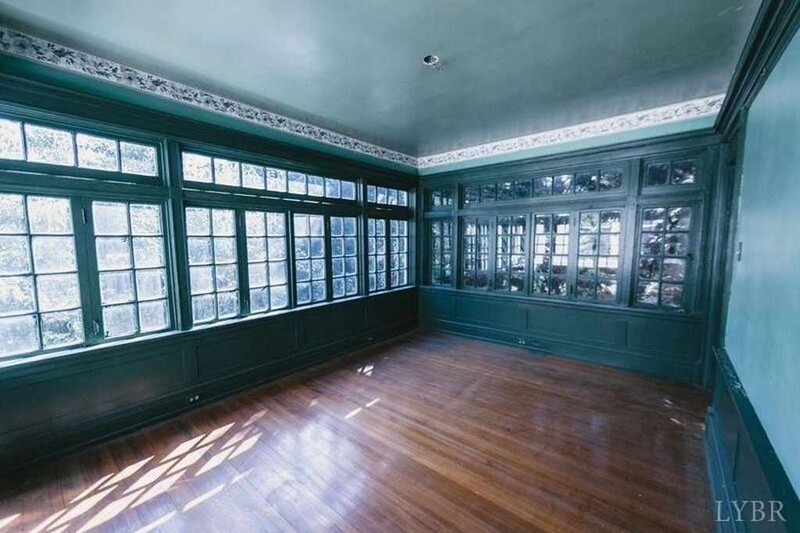 The sunroom, fireplaces, especially the fancy tile work. 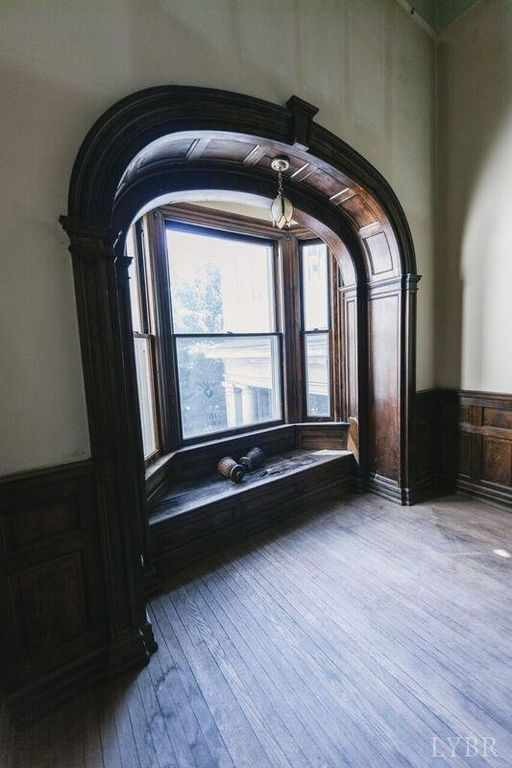 Gorgeous arch top window seat,& staircase. and again cuz they are SO AMAZING the lights! OH MY! 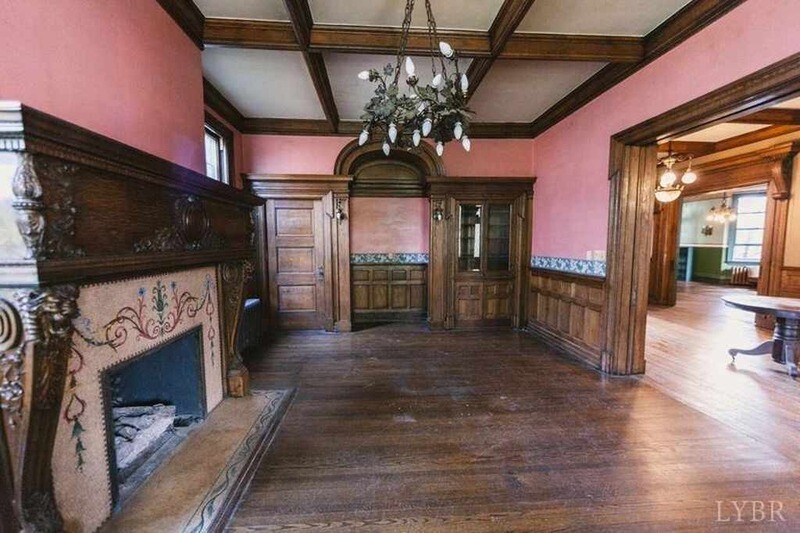 This property is exquisite and a little creepy. I couldn’t find any history on what this place used to be, but I would suspect a nursing home or something of the like. 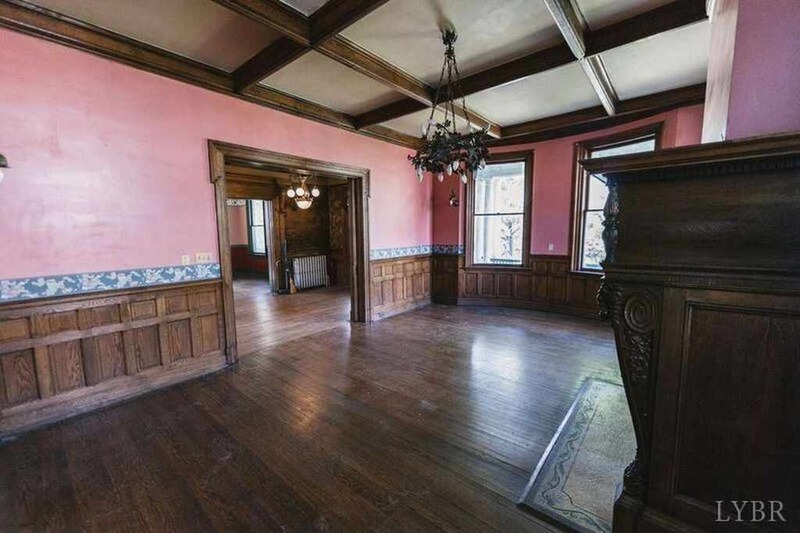 In any case, this home has so much charm and would be a spectacular place to restore. 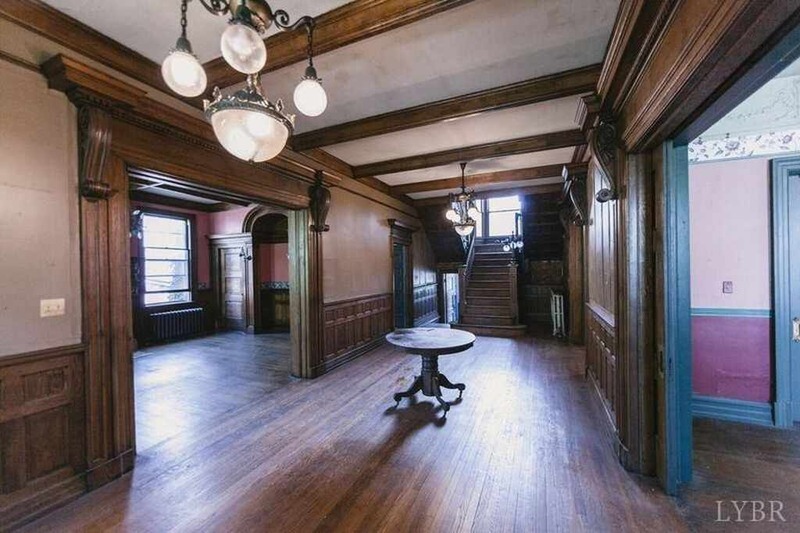 Someone is going to be so fortunate to own this place and I can only hope they blog about the restoration. F A B U L O U S!!!!!!!! This house just stuns me. I love love love it. Thought of you, Ross, immediately when I saw this home! 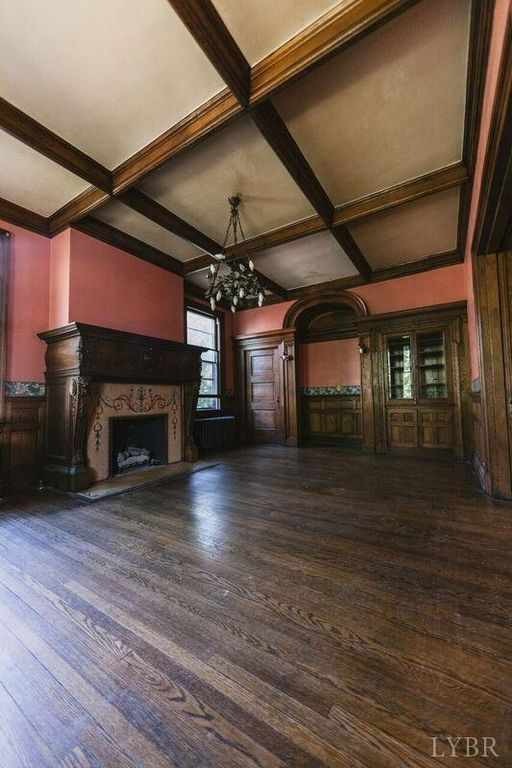 This house screams SAVE ME! 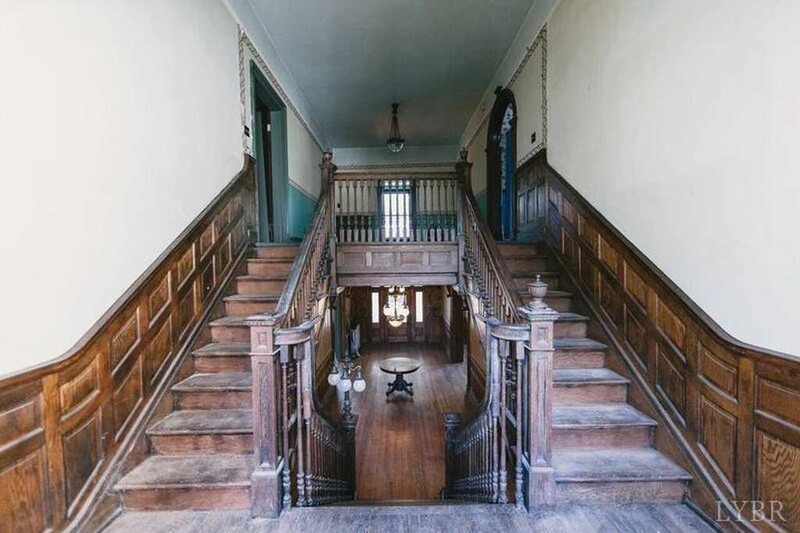 Well, not much to add to the ecstasies of fellow old-home lovers, but wow! What a beauty! 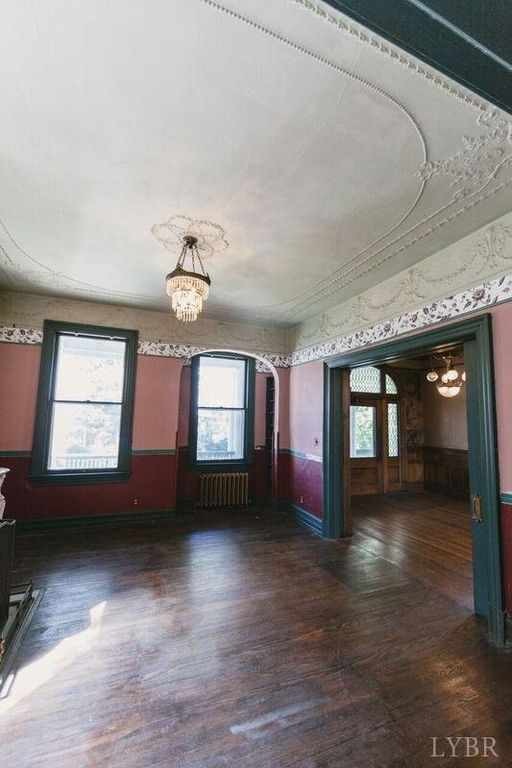 So much original detail retained, that huge center hall is one of my dreams, and the whole house looks like the Victorian family that built it just stepped out for the summer at the shore! What I wouldn’t give to be able to buy such a beautiful home. 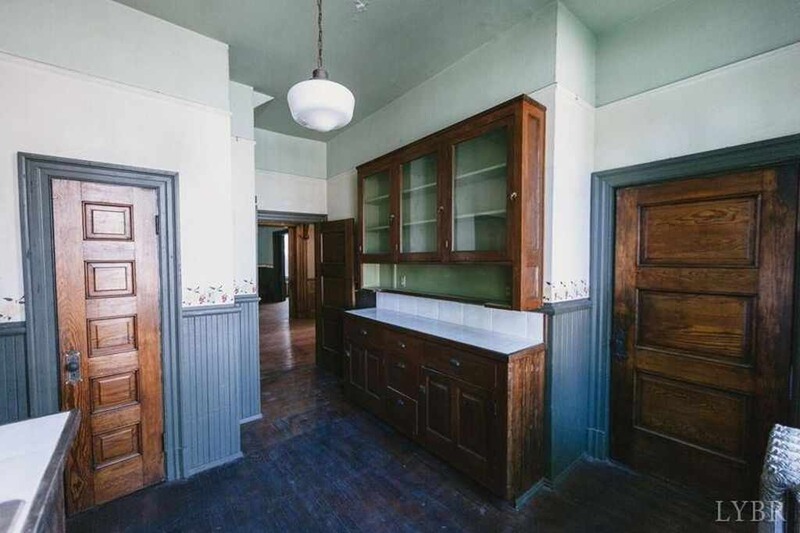 It would make a fantastic B & B, at least then it would hopefully be maintained and not “modernized” inappropriately. 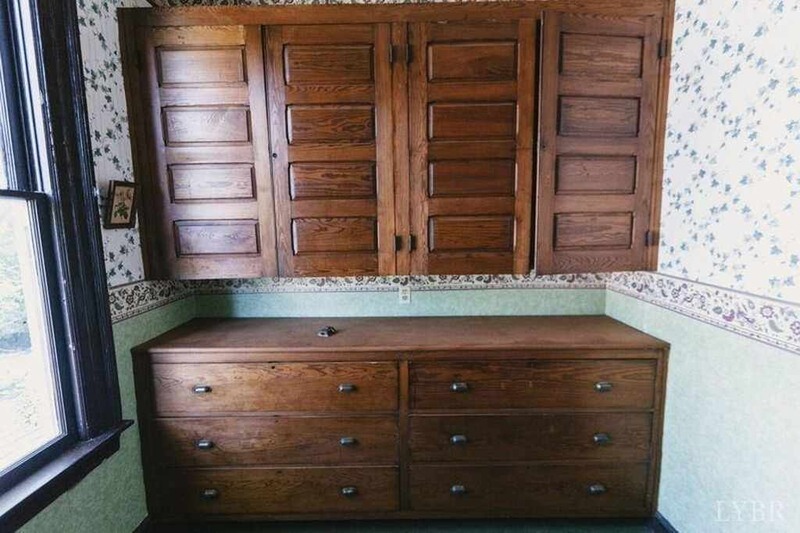 I’m such a sucker for all those original built-in cupboards. 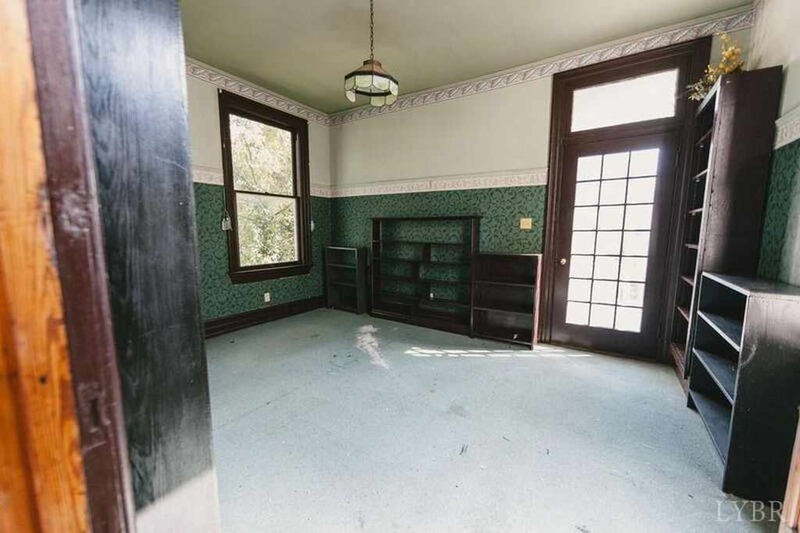 This is a house that truly lives up to the realtor’s description. No — strike that. It EXCEEDS the glowing write-up! The integrity and beauty of this place! How could anyone ever want new construction? This is yet another example of the mastery of architecture, that is the work of George F. Barber. One of several Barber house examples in Lynchburg. 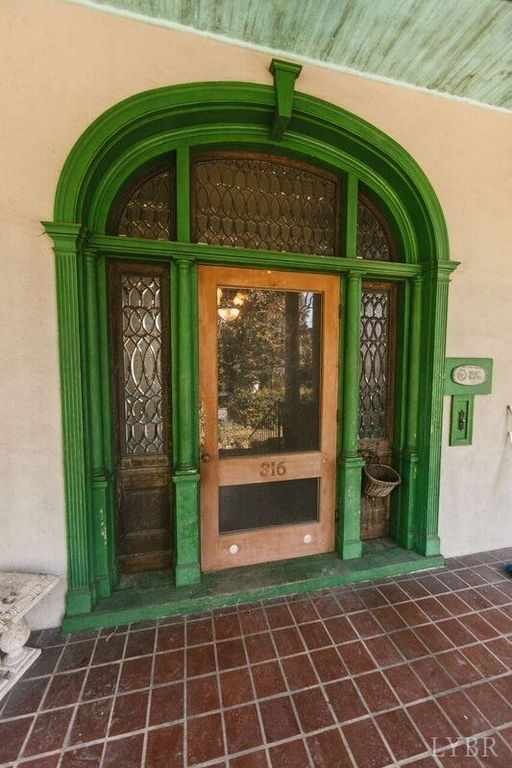 This particular example is quite a bit larger and more grandiose than the published version of the design, which leads me to believe that this home was constructed for someone of importance and considerable means for the early 1900’s. This one is off the charts. 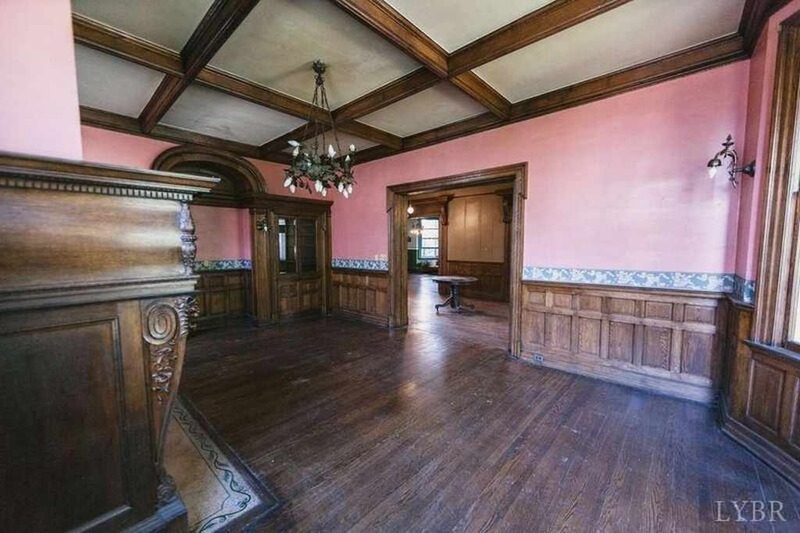 I hope someone sympathetic to preservation buys her and preserves her. She certainly deserves that. A standout even in the Barber universe. Feel like I’ve died and gone to Barber heaven! 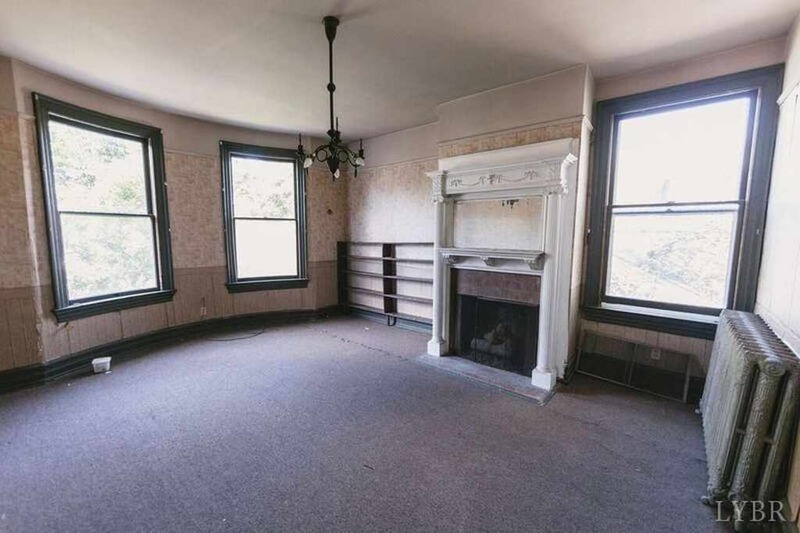 Hey Chris–Is this a Barber house? 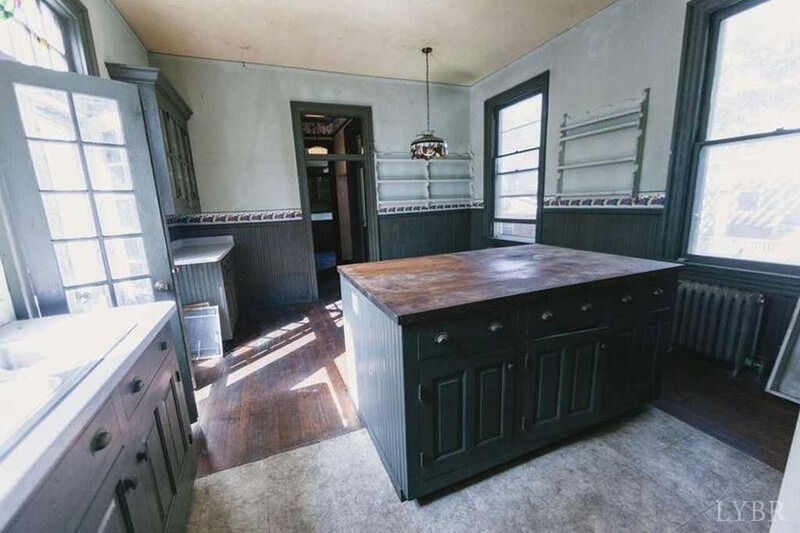 From what I can see in the listing photos, this house does not appear to be a Barber house. JMHO. AMAIZING! Love this house. 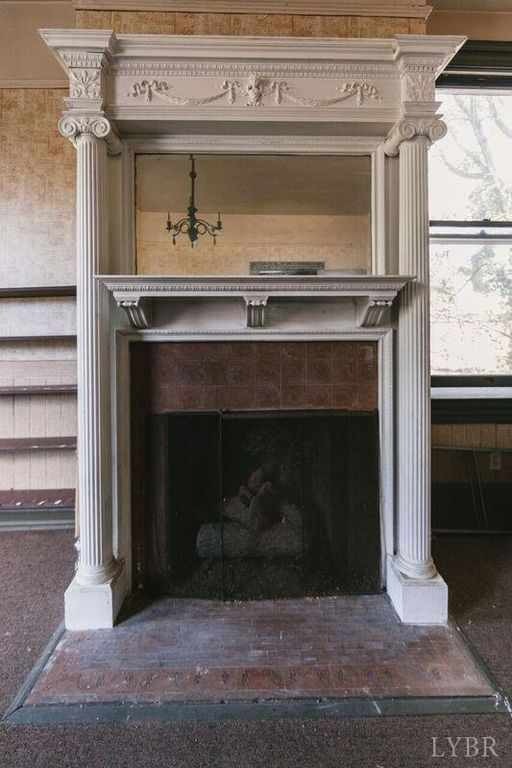 I couldn’t help but just stare at the tile on that fireplace. I wish my year 2000 built house and 1/100th of the character of this place. 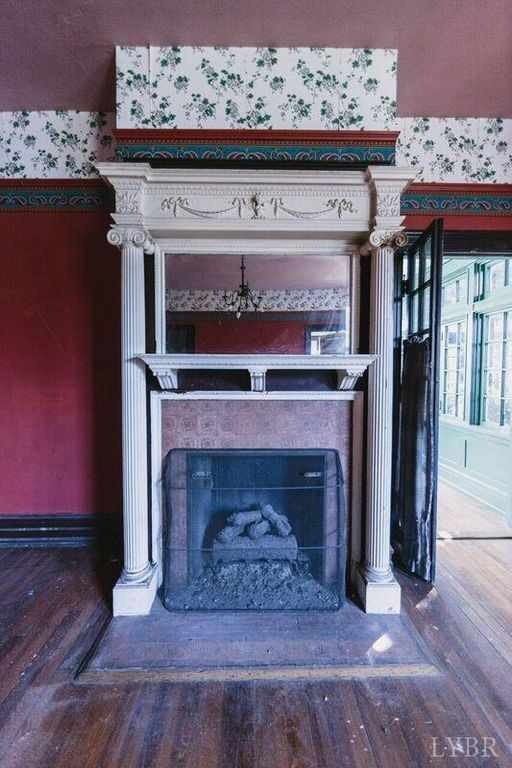 Further research has revealed that this was the home of Montgomery H. Dingee and his wife Elizabeth. Dingee was the Vice President and then later, the President, of the Southern Fire Insurance Company. I love that house and would love to get in there. The first thing I would do is get rid of that hideous wallpaper/boarders. huh. 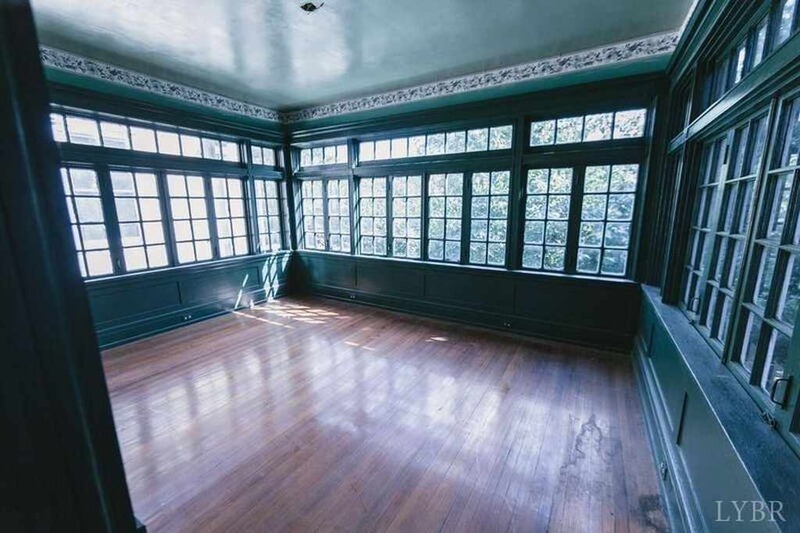 I do agree with just about everything everyone else is commenting on except…I am seeing GREEN (pun intended) about the woodwork being painted. 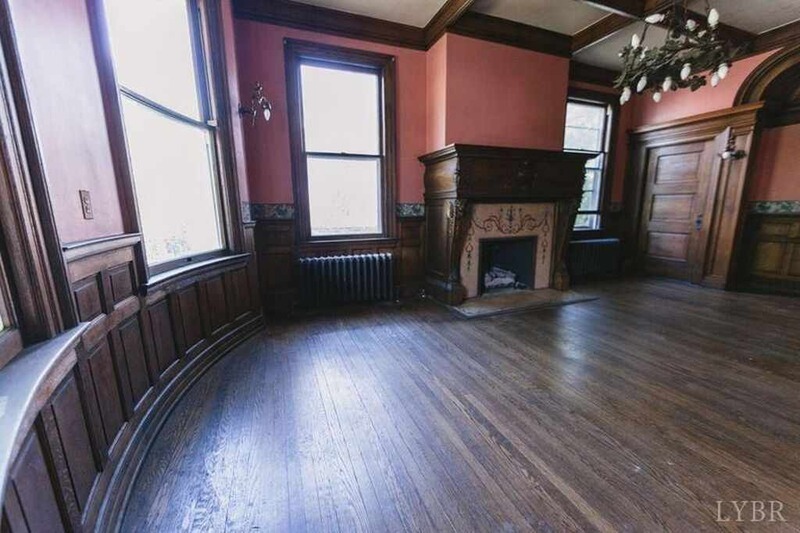 The one room with all the windows, what a chore that would be to restore. 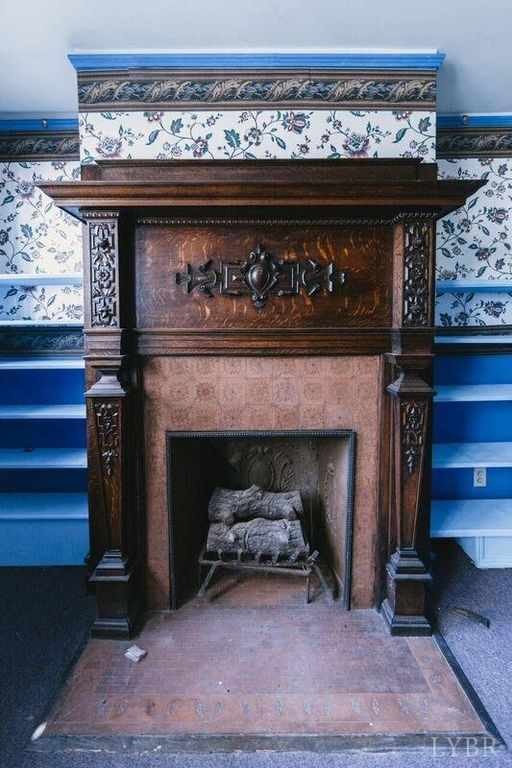 I do have a question for anyone who may know, do you think some of the fireplace surroundings are original? 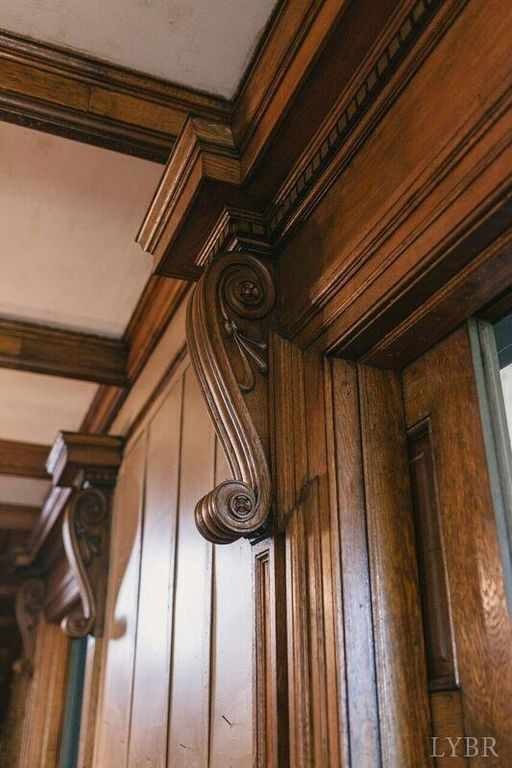 The style of some of them do not seem to match the other woodwork in the house. 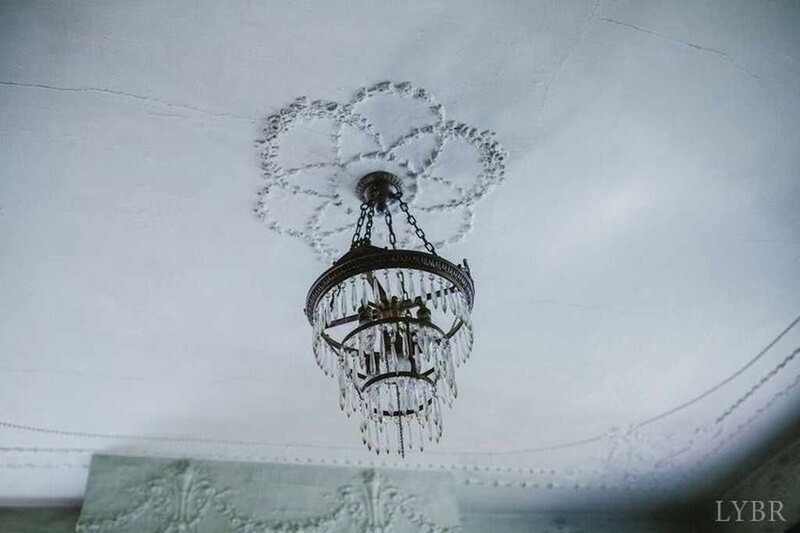 The plaster work in that one room is absolutely beautiful and so delicate. Holy Wow!! Pass the smelling salts, please! Grand Dame that exceeds every detail of architecture and construction that most of us Old House Dreamers admire and love. She deserves the Royal, pampered, white glove, treatment to protect her and bring her back to her gracious, sophisticated beauty. 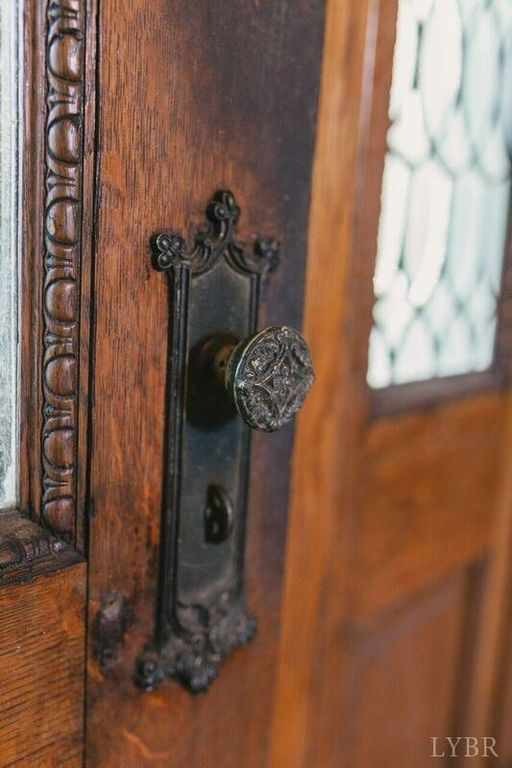 Too many in tact details that I love to even begin to mention—the THICK oak woodwork and carvings, mantles, wood work casements of windows and doors, floors, ceilings, block wainscot…on & on & all located a top a hill on a tree lined street with more homes of similar excellence in a gorgeous area and super lovely town. All that said, only a 1 percenter income could afford to live here after it is restored; since it would require a Crew of various skill sets to clean and maintain her. Definitely the Best of Best that I have seen on OHD that is not yet “turn key”. This is a stunner. 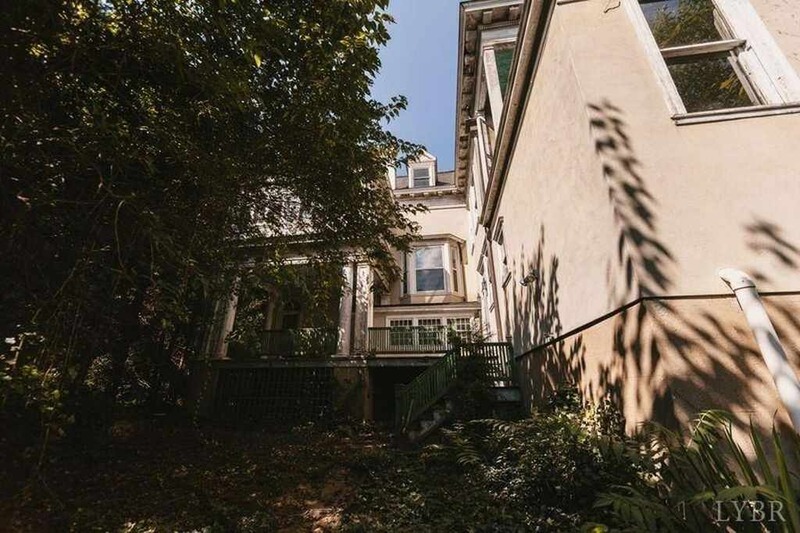 Wish there were photos of the “secret garden.” And I love seeing old houses with front porch ceilings painted “haint blue” to keep the ghosts away. i think this is my absolute favorite house so far. 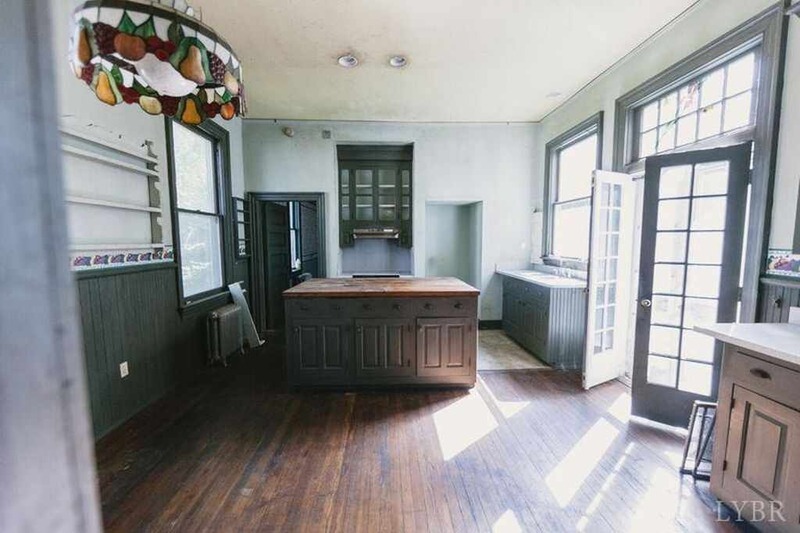 even the kitchen retains it’s charm! 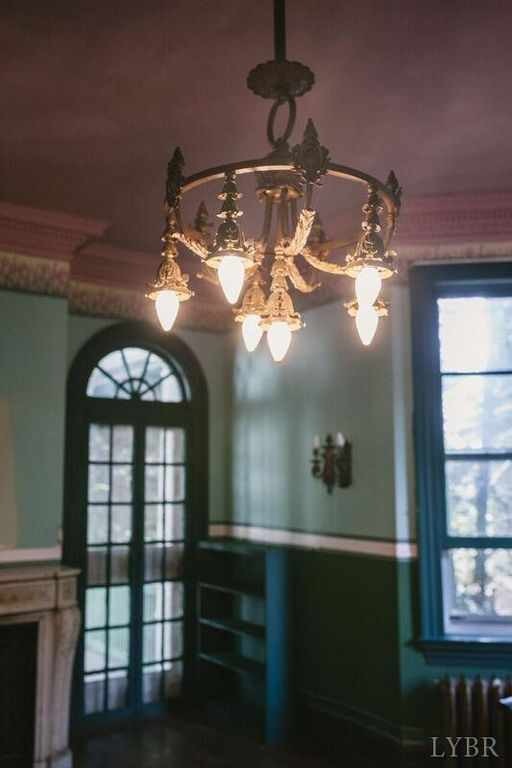 The realtor took stunning pictures and showed every lovely detail. i could look at this house all day. This house. Lord have mercy. 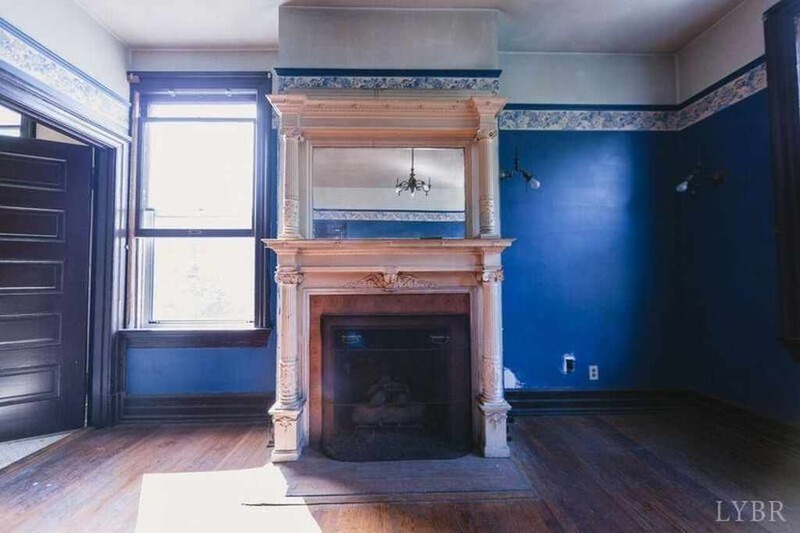 All it needs is a little polishing here and there, some love and the fireplaces lit. Can y’all imagine what it would be like to host a Christmas party there with all the lovely decorations and the sweetness of the season? 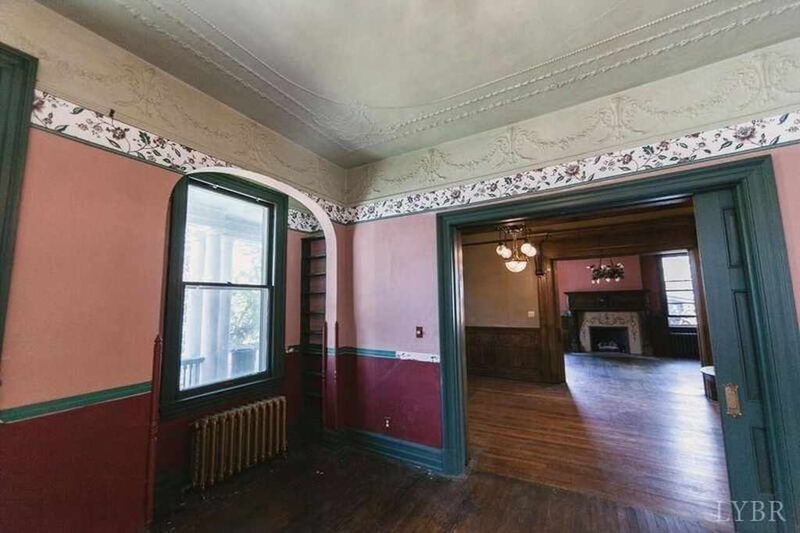 This house would be a beacon of historic style and beauty in the right hands-let’s all hope the right hands come along and write a check ! Fabulous features in an important historical location. I think this could be a premiere B&B or boutique hotel, especially catering to travellers interested in history. Wish I were younger, I’d take it on! Lynchburg has done it again!! 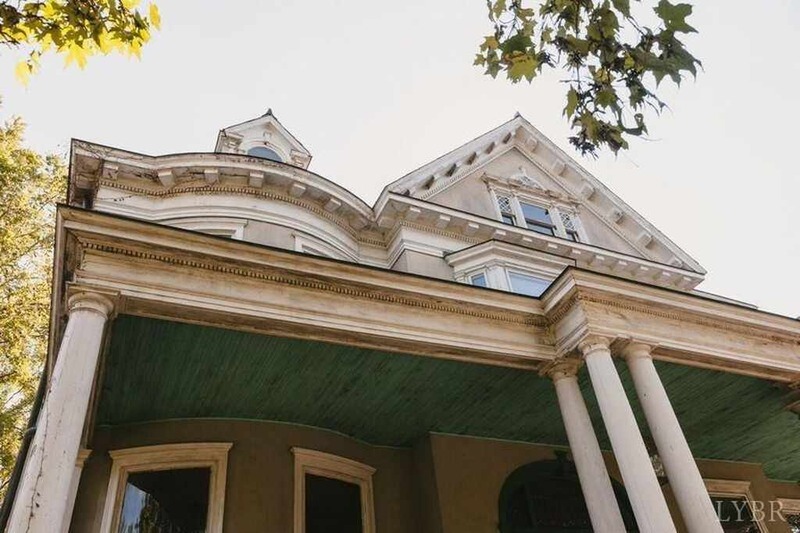 It was the Italianate on Court St that had me find Oldhousedreams (which I visit nightly) – and I must say that this one tops that, and I must now book a ticket to go and visit Lynchburg VA to see if this place can be my home!! LOVE IT!! Thanks again Kelly – We ADORE you!!! Now everyone, please, no more comments, otherwise someone will beat me to it! 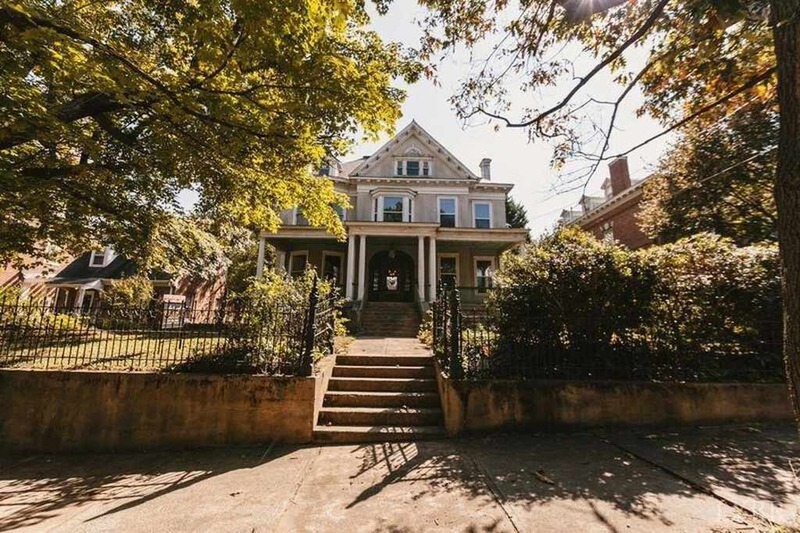 lbbj, you’re right that Lynchburg has done it again, actually outdoing itself with this amazing house, which is fun to look at and dream about. 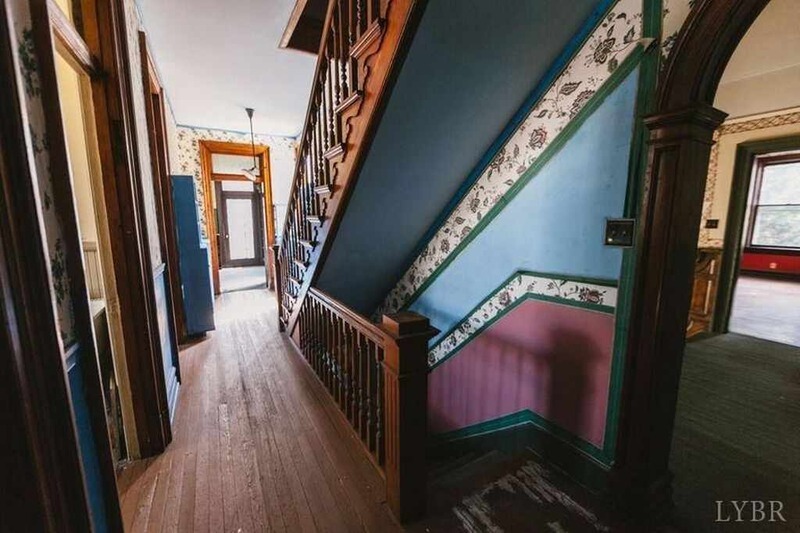 However, like the Court Street house, this one will likely be on the market for a long time, and go through a few prospective buyers unable to finance the purchase, much less the restoration. Like that one, the asking price is extremely optimistic in a neighborhood where the median sale is about $70k and the median household income is about $20,000. Actually the neighborhood here is worse by traditional measures than Court House Hill. The State Police report this is the highest crime area of the city. 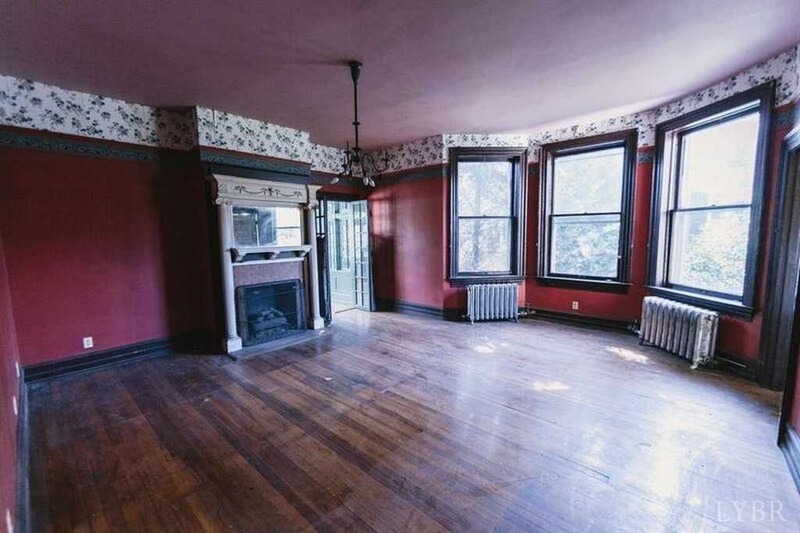 The Court Street house asked $450k and sold for $167k; similar math puts this one less than $150k plus substantial renovation costs. Fun to dream about but the house would be a monumental challenge for most folks. 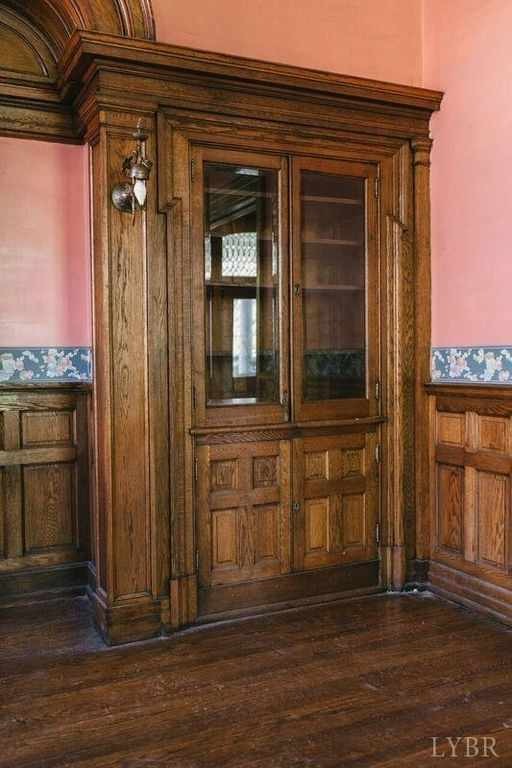 That door!! 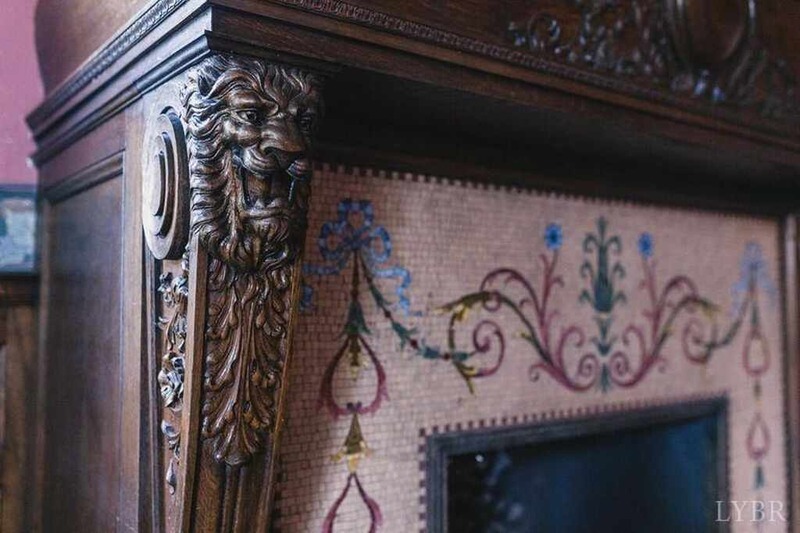 O_O And also love the mosaics surround of the fireplace! Beautiful house! Perhaps the last inhabitant was a collector and used the shelving to display some sort of collection. 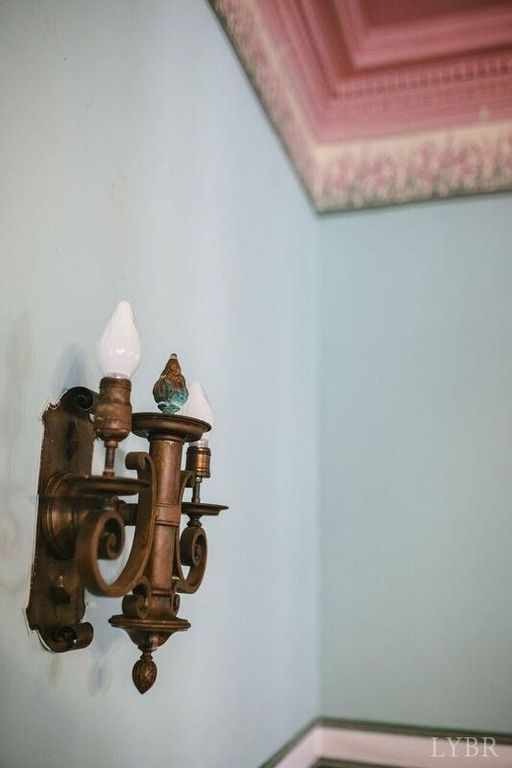 It also appears the two missing finials from the newel posts are sitting on the landing window seat. Hopefully they will not get lost before they are reattached. 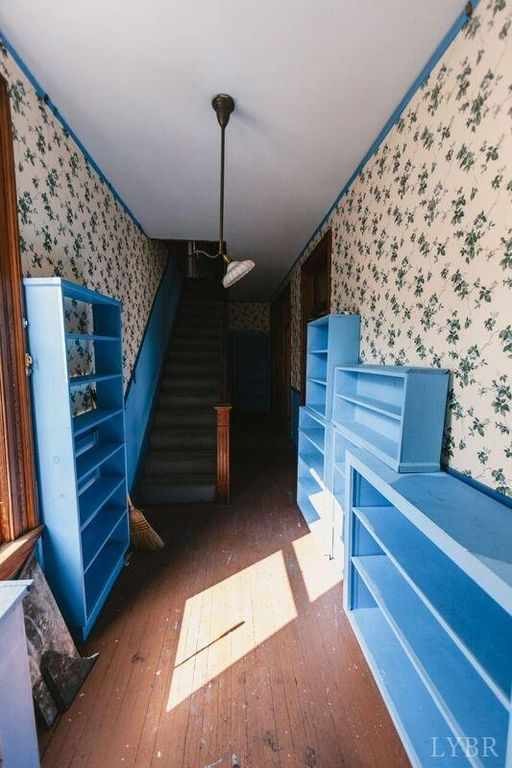 JimH, I hope you are correct and this house is for sale for a while. I won’t be ready to move from Southern CA for a few years. 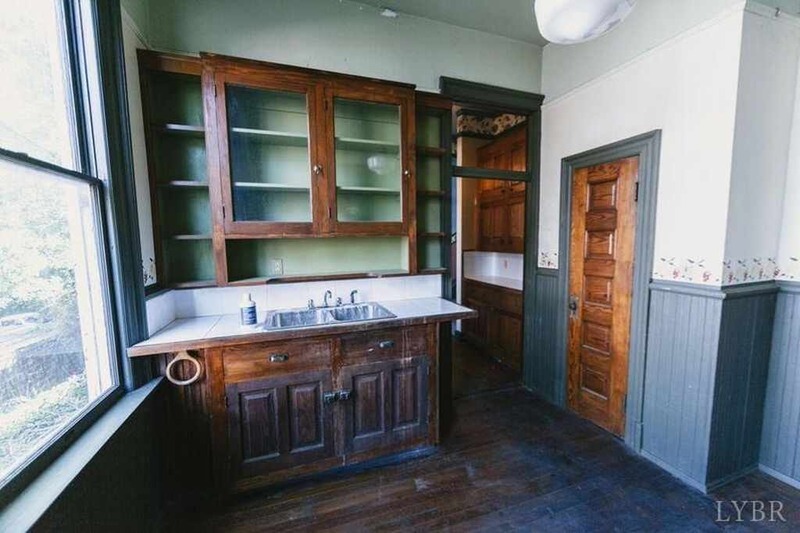 My engineer husband and I need a project and there is nothing about this house I would change except restoring the painted cabinets in the kitchen and the painted woodwork and trim upstairs. 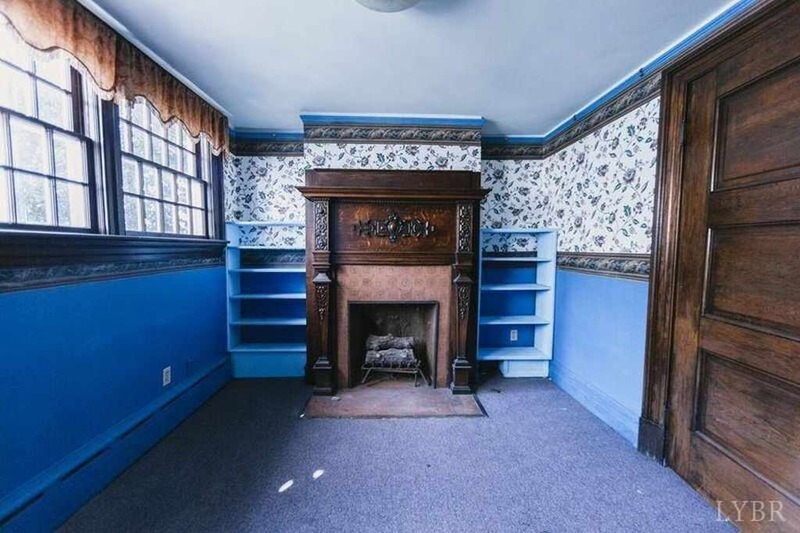 Oh, and the upstairs blue paint has to go. Wish there were pictures of the bathrooms. Can someone visit and take some? A stunning house and the street is filled with houses of similar size. 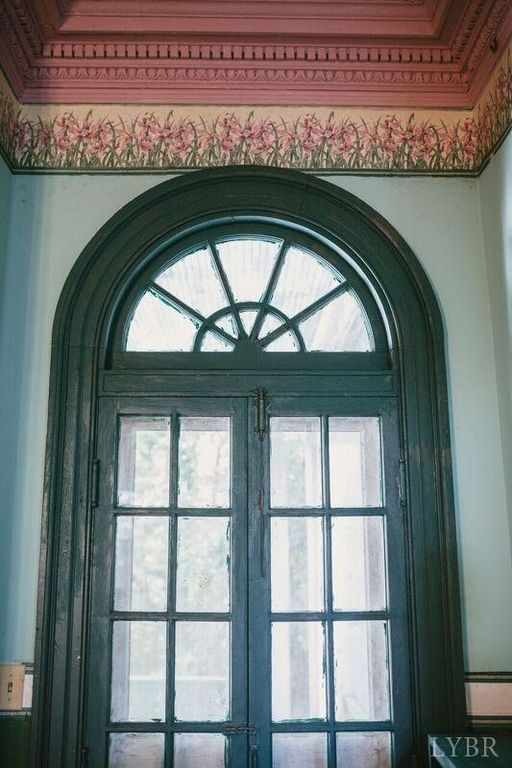 I am wondering about the stucco exterior and when it was installed. It’s just my feeling this may have had lap siding or perhaps even brick. House next door to the left was turned into apartments. House to the right sold in 2004 for $575K but seems to have combined several lots to make a huge macmansion property. 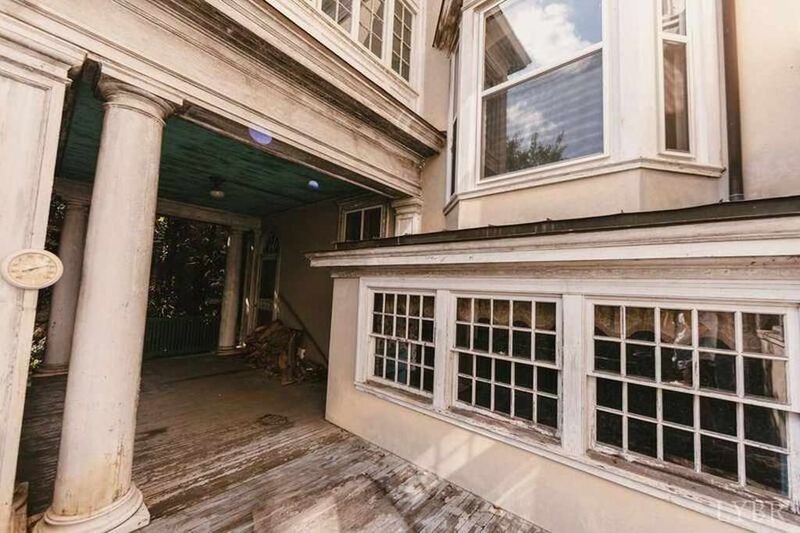 There seems to be no garage or off street parking for this house which could be a problem. There is an abandon flour mill a few blocks away by the river that seems to be the source for a lot of the crime in the area but this street shows safer on the crime watch meter. First, I must wipe all of the drool off the iPad. Second, I want you all to know that when I die and go to heaven, this will be the home that Bob Seger and I will reside in!😍 We will have many children to fill the bedrooms! We will have a lavish party where Bob will introduce the song he just wrote for the love of life (me) and you all will be invited!! Hey, it’s part of my ” old house dream” ~ Dream BIG!!! I noticed the Virginia Liquor Store is right next door to The First Baptist church at Court and 12th. How funny is that! 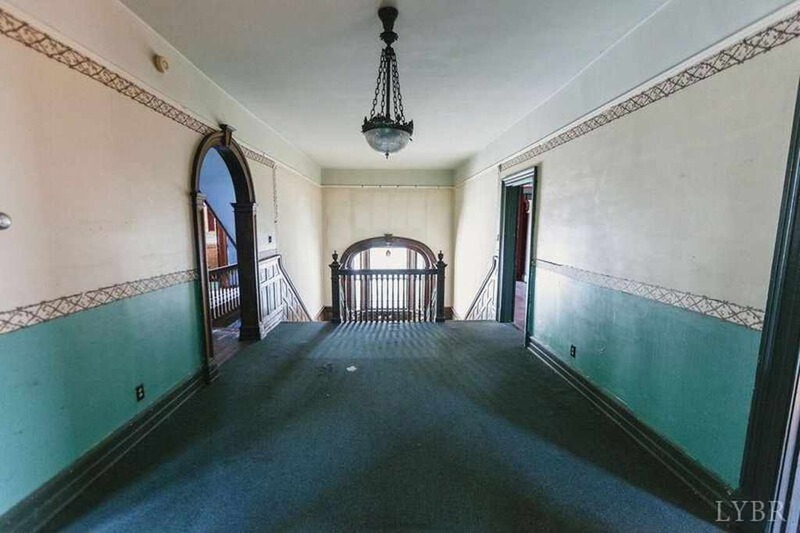 Richard Goodson, I believe if you look at pic 57 the window on the staircase landing there looks to be the 2 missing finials from the newels. In most communities, liquor stores, taverns, smoke/head shops, and other retailers not allowed to sell to minors are restricted by zoning guidelines that regulate how far they can be located from Churches, schools, and sometimes private residences. My hunch is that the liquor store-Church proximity predates zoning laws and is grandfathered. Either that, or no such zoning exists in Lynchburg but I suspect that it predates zoning restrictions. It’s is an unusual arrangement in any case. The 1910 census shows Mont Dingee living here with his wife Elizabeth and 19 year old daughter Bertha and two servants (mother and daughter) listed as cooks. That same year, he sold the house to David Dreyfuss (also in insurance) who sold it again in 1917 to Gustave Stalling a tobacco exporter. Stalling owned the house until 1943. It’s funny because the 1930 census shows Elizabeth Dingee living in a rented apartment on Rosemont St. with her daughter, son in law and several grandchildren. Montgomery passed away in 1927. I wonder why they only lived there for 6 years. Bad investment perhaps. After the Stallings, the house was bought by the Hoppenstein family from Poland who owned it until 1970. 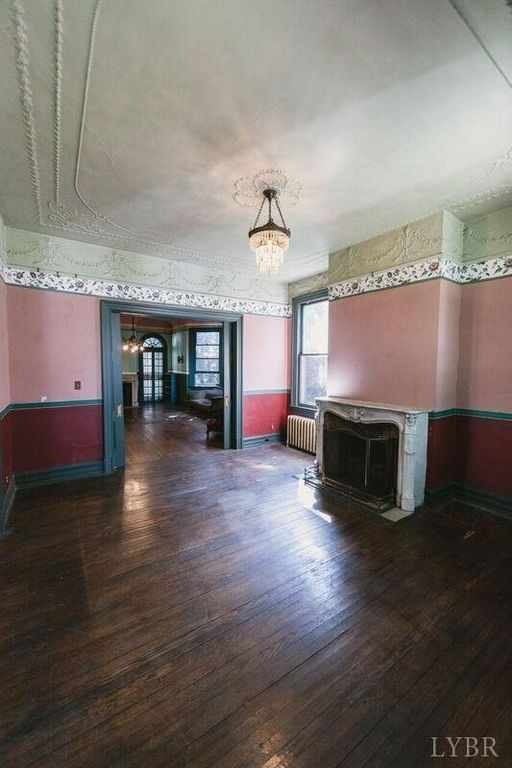 There were 3 more owners after that so it is amazing that the house is in such original condition. Wow, what a gem. I would love to get my hands on this! Thank you Lord in Heaven for every last stick and splinter of this house. It’s perfect. George F. Barber created a masterpiece! “Pressure washing”???? Please please people stop pressure washing these old homes. It’s the worse thing you could do to it. The inside seems well taken care of. 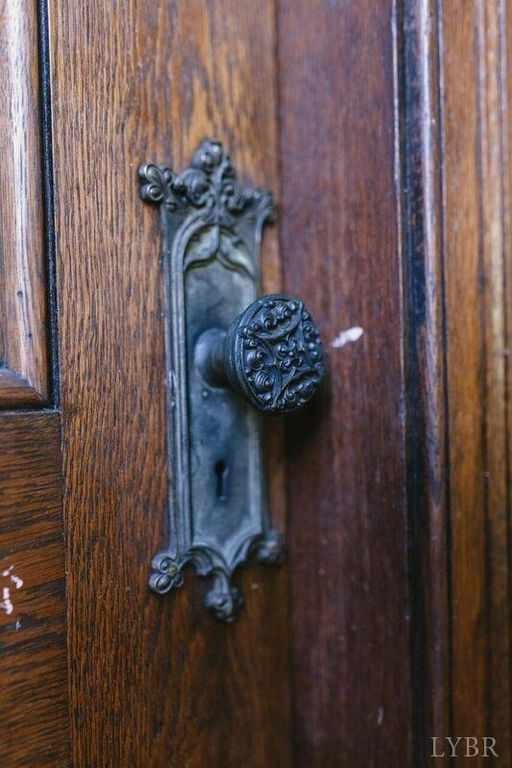 Perhaps the past owner was elderly? They really let the elements deteriorate the exterior. Sad, but salvageable at that price.